Volunteers are the heart and soul of Grey Bears. 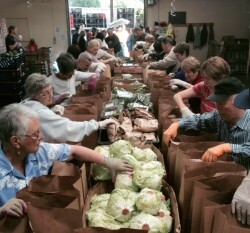 Volunteers are needed to help on the Brown Bag program: assembling bags of fresh produce for seniors on Thursday and Friday mornings between 7:30am and 9am. Before volunteering we ask that you attend an orientation. We hold an orientation every Thursday at 1pm in the main office of Grey Bears. We also always need drivers to deliver bags of groceries to distribution sites and to homebound seniors (and we’ll reimburse your gas mileage!). The Grey Bears Brown Bag Program is one of the most efficient and successful food distribution programs in the United States. Volunteers glean the fields, help collect donated food from local stores and supermarkets, assemble bags of food in our warehouse and deliver it to a network of sites and medically homebound seniors throughout Santa Cruz County every week. This year, through our produce recovery program, Grey Bears will distribute 2.6 million pounds of fresh, nutritious food to 4,200 Santa Cruz County seniors.